Ganesh Chaturti is celebrated with an extra measure of grandeur in the state of Maharashtra. The Siddhi Vinayak temple in Mumbai is visited by hundreds of thousands of devotees throughout the year. 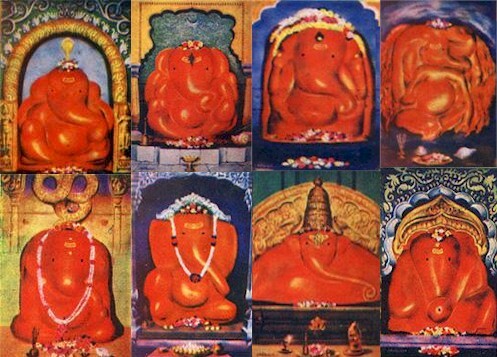 Also in Maharashtra are eight temples dedicated to Ganesha, related to various episodes from the puranas and other legends - and these deities are collectively known as Ashta Vinayak. Moregaon enshrines Ganapati as Mayureshwar (Moresh) or the peacock rider, who slew the demon Sindhu in response to pleas from the Gods. Mahaganapati at Ranjangaon is believed to have come to the aid of Shiva in destroying the citadels of the demon Tripurasura. Mahad enrhsines Varadvinayak (the bestower of boons), in commemoration of a legend related to Rukmangada. Chintamani Vinayak relates to the legend of Kapila Muni and the Chintamani gem that he had obtained from Shiva. Girijaatmaja Vinayaka is enshrined on Lenyadri Parvat, and is believed to be a manifestation of Ganapati as an infant. Vigneshwara at Ozar is regarded as the slayer of the demon Vignaasura. Ballal Vinayak at Pali, is associated with a legend where Ganapati is said to have come to the aid of a young lad, who was a fervent devotee of Ganapati. Siddhi Vinayak at Siddhatek is said to have come to the aid of Mahavishnu as he was engaged in a long battle with the demons Madhu and Kaitabha.